Haight Ashbury Natural After Shave is a premium luxury after shave splash and cologne. It has well aged, dark Patchouli, French Lavender, Tobacco Absolute, Vanilla and Coconut. 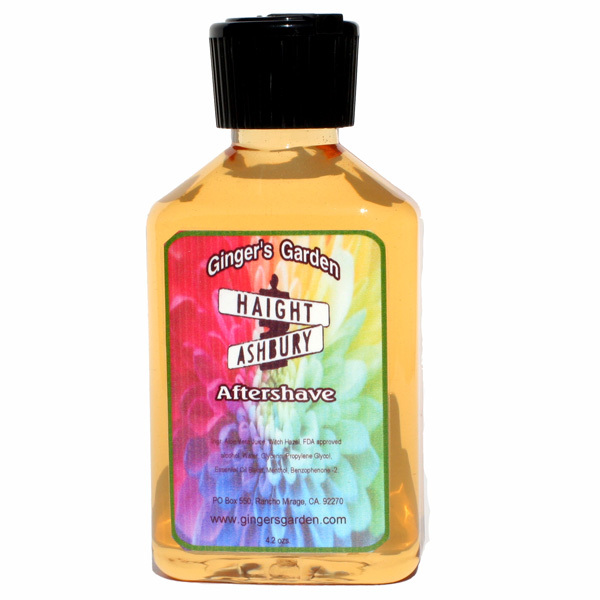 Haight Ashbury Natural After Shave is a premium luxury after shave splash and cologne. It has well aged, dark Patchouli, French Lavender, Tobacco Absolute, Vanilla and Coconut. The Patchouli is predominant long term and in the drydown along with the Tobacco. The Lavender is light and well balanced. The Vanilla and Coconut add some sweetness. It contains natural aloe vera, witch hazel and a touch of menthol. Haight Ashbury essential oils blend is rich, earthy and intoxicating! Don't judge this custom blend by the first whiff. It mellows out quite nicely. Haight Ashbury Natural After Shave is a compliment to the shaving soap that's also available in the man's shaving soap section. Each bottle comes with a cap that has a flip up spout. It’s easy to dispense and use. Ingredients: Aloe Vera Juice, Witch Hazel, FDA approved alcohol, Water, Glycerin, Propylene Glycol, Essential Oil blend, Menthol, Benzophenone -2.